The Notorious B.I.G. introduced the world to the grandeur of his double album Life After Death with the lead single “Hypnotize,” released on the first day of March 1997. The song became one of Biggie’s most popular tracks not just because of his mastery of mellifluous rhyming, but also because of the Paul Hunter-directed video. 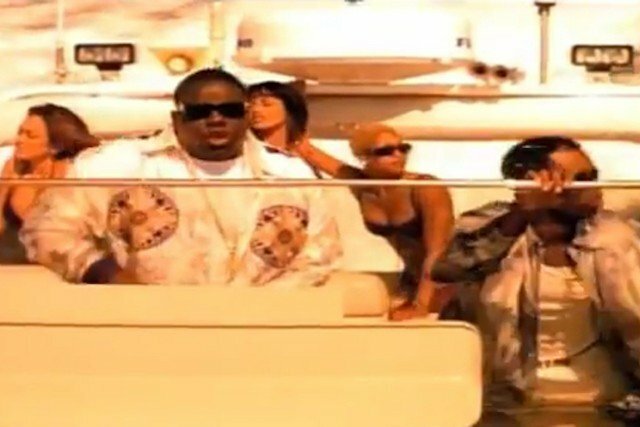 Centered around a Big Poppa removed from Ready to Die’s Bed-Stuy grit and now indulging mafioso excess, the high-octane, big budget visuals of “Hypnotize” were a step into the glitzy aesthetic Bad Boy Records trademarked at the close of the millennium. Of course, Biggie wouldn’t live to see the style’s ubiquity nor the release of Life After Death, a triumphant-turned-tragic piece of the hip-hop canon that still stings 20 years later. I met Biggie through Puff. We did “Can’t Nobody Hold Me Down” and Biggie came on and did a cameo. We did a short scene in the opener before the video started and Biggie was a part of that. We met on set there and stayed cool with each other. There was a lot of talk because Biggie was really hot and he had [Life After Death] coming out—there was a lot of people who wanted to direct it. I remember hearing names like Michael Bay and there were a lot of people that they were talking to. I just was relentless on wanting to work with him. I loved the track. The whole thing was that we wanted to show this buddy comedy and really bring out the friendship and the personalities of Biggie and Puff together. They were like a dynamic duo, and it was really just saying if you get on the ride with Biggie that you’re gonna find yourself in a really unexpected place. That was the whole way of thinking all along—even where the police are chasing him and he’s driving the whole thing in reverse. We didn’t have a huge budget [around $900,000], but we had to coordinate an action aerial shot with these military helicopters. What was interesting is that we only had a certain amount of times we could have those helicopters. We filmed in Santa Monica so there was only a certain amount of time we could actually have those helicopters fly over into the scene. They literally flew in as we were filming the scene. We were in contact, we wanted to have the shot during sunset—and you know there’s a small window during sunset. So we coordinated the timing with the military helicopters to leave Palmdale and get to Santa Monica to fly on our scene while we were filming and do it all in one take. So we did that scene all in one day. When you see the helicopters flying they literally flew in, shot, turned around, and left. Diddy was driving the boat, but we had the captain. It’s a funny story because you can’t really see him, but when we first got to the boat, the captain saw Biggie and Puff and said, “Hell no, I’m not letting this guy drive the boat.” He went on the boat with us. He just didn’t trust that these guys were gonna drive the boat, which I don’t blame him. You can see in some of the outtakes that we’re driving the boat too fast, and this guy is poking his head out in between takes watching to see if we’re going to crash into something. He had the cane and he used it as part of the humor. It kinda fell into his backstory a bit, in terms his audience knowing that he was in a car accident. Actually, seeing him in the video with a cane, I think it added to the excitement. We just put it in there: It was a cool-looking cane. It just went with the vibe. My favorite memory was at the end of the day shooting the boat scene—the shot’s at the end of the video when they’re cruising off into the sunset. That was my favorite memory because when you pull back, everyone was happy. We were filming as we were going back to the docks. So it felt satisfying, because we had done all this work, and as we were on the way back, we were filming and it was just beautiful. Biggie never got a chance to see it in completion. I showed him about a minute and a half in the early rounds and he was really excited. He smiled like a kid: This big, warm smile. He never got to see the final product. I never thought that people would still be talking about it today. During that time, it felt like I was just pushing, breaking the rules. We weren’t playing by anybody’s rules and we were trying to elevate the genre and bring more light to it. I’m glad you still see that positivity—that energy to push and create, it’s still happening. It makes me feel lucky, I’m happy to be a part of that. Tags: Paul Hunter, The Notorious B.I.G.